You know what I love about the City Walk development? Their leasing strategy. Forget the usual mall fandango of Cheesecakes, Shake Shacks and Starbucks – City Walk has some totally off the hook choices. For example, just the other day, I was lamenting the lack of a good flower boutique and cafe in Dubai, and lo and behold, I came across Jolie Café at City Walk. Jolie Café, Dubai’s latest flower boutique and café, opened in City Walk a few months ago. 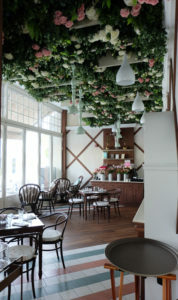 Out of all the other flower boutiques and cafes in Dubai, Jolie Café must be the prettiest. It’s as if my elderly aunt moved into an Interflora shop and started a catering company. Sitting on the outskirts of City Walk, Jolie Café is a small little place with an unassuming beige awning and a street side entrance that is a little difficult to find. They call themselves an urban meadow. An urban meadow – their words, not mine. As we walked in, we had to double check the meadow was open for business. The lights were off, it was deadly quiet, and there was a lone man, quietly mopping a corner of the floor. He looked a little shocked that we had walked in, but mop still in hand, he greeted us with a smile and assured us they were open. He suggested a table for us to sit at and quickly delivered us some menus. 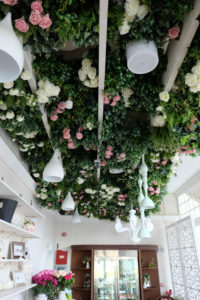 Jolie café is country cottage cute, with ceiling installations of lush English rose gardens. Plastic, of course, but there is an old saying in restaurant design – if the customer can’t touch it, then fake it. The flooring is a nice hybrid of tiles and wood, and the tables and chairs are white cushions on dark wood. There is residential cabinetry dotted around the place, and we were sat next to some shelving that was home to some lovely little trinkets. However, as we looked through the menu, I felt the absence of lights and music. This urban meadow was a little flat – a little filtered and dull. Where was the aroma of freshly cut flowers, or the brightness of the morning sun, or the sound of life? There was just the whirr of the AC, the tired sigh of the refrigerator unit in the back and the swish swish of the mop. 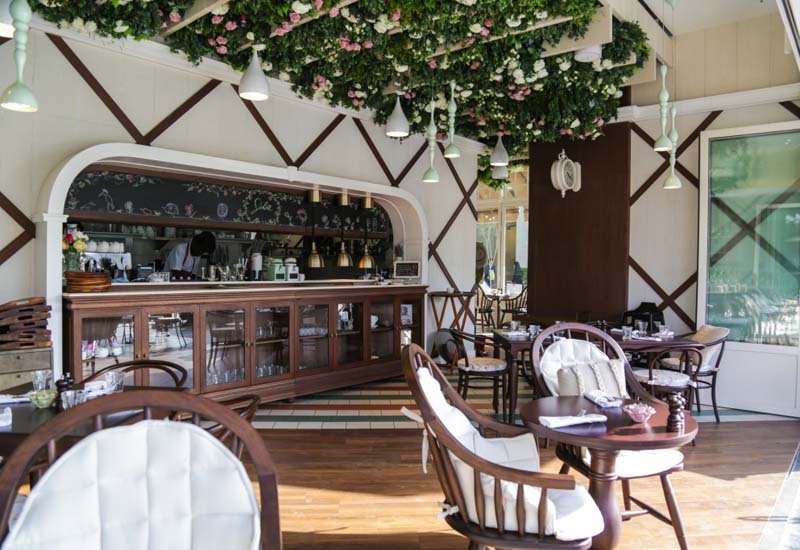 The menu was surprisingly substantial, offering breakfasts, salads, main courses, cream teas, sandwiches, kid’s meals, cakes, patisseries, desserts, and macarons. That’s a heavyweight menu for such a delicate place. To go from eggs benedict to warm lobster salad to rack of lamb to high tea is quite a feat for a small little café. It’s like a flyweight boxer wanting to compete in every weight class. Or a crazed horticulturist trying to win every single category at the Chelsea Flower Show. Our waiter, looking much more focused, came over to take our order. He was shy but friendly. I ordered a flat white and the Serb, clearly feeling adventurous and liberated in the urban meadow, ordered the chocolate tea. My coffee order arrived on a tray that was almost as big as the table. It contained a good-sized mug, with sugar bowl, cookie and a large floral decoration that looked like it was stolen from a nearby wedding reception. The chocolate tea arrived in similar fashion, with flowers, a teapot, and a tea timer. It was all very over the top, and I was beginning to see what the concept was about. Not only did our table now look like something out of the Royal Botanical Gardens, but eighty percent of it was taken up by one cup of tea and a coffee. Unfortunately, our drinks were very much style over substance – the flat white masquerading itself as a scalding hot watery latte, and the chocolate tea was like chocolate flavoured hot water, according to the Serb, who politely hid the half full teapot behind a picture frame on the shelf. We ordered three breakfast dishes – the savory crepe roll, buttermilk pancakes with caramelized bananas and the mandatory avocado toast with beetroot hummus and halloumi cheese. Avocado must be a chef’s favourite ingredient at the moment – it is an incredibly forgiving ingredient. It requires only basic hand to eye co-ordination to prepare, has tremendous versatility in the field – and people are still quite mad for it. Jolie’s avo toast was good, the beetroot hummus was moist and oddly quite spicy, which I didn’t expect, but didn’t dislike either. The halloumi cheese was pre-grilled unfortunately, but generous in size. Overall, a good attempt at a menu dish mainstay. 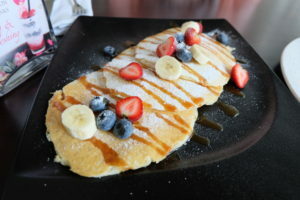 The savory crepes were described on the menu as two cheddar cheese, and crispy turkey bacon filled crepes. They forgot to mention the three tree trunks of asparagus and sun dried tomatoes they sneak in there too. For me, the sharpness of the sundried tomatoes was too overpowering for the dish, although the crepe was nicely cooked and they use a good quality cheddar. The menu also promised the buttermilk pancakes would have caramelized bananas served with it. However, when the dish arrived, the bananas looked decidedly spritely and very un-caramelized. The pancakes themselves had the stodge of undercooked batter and fell very flat for me. Although, full disclosure, it didn’t stop me from polishing off the plate. Perhaps Jolie Café’s baking is their strength – their sourdough bread for the avo toast was excellent, and the bread basket was warm and fresh and showed some confident use of savoury flavouring. They have a good cake display and an impressive range of patisseries too. There is a clumsy charm to Jolie Café. Yes, they serve sweet strawberry butter with their savoury tomato bread, and they sneak unadvertised ingredients into their dishes. 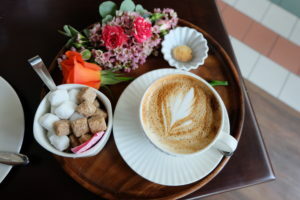 Yes, they need help with their coffee program, and the humble avocado saved breakfast, but you get the impression they really want to brighten peoples’ day with food and flowers – and there’s nothing wrong with that. It would have been nice to be told that at the beginning of our breakfast, though. 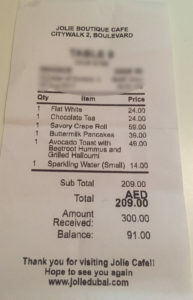 I love the Avo toast gets its full title on the invoice! The power of the Avo!